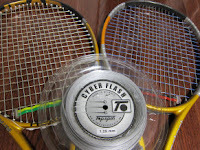 Head Instinct (YouTek and LM), Cyber Flash 17g for mains, Ace 18 and Cyber Blue for crosses (respectively). Agassi in his autobiography Open comments: "polyester string, which creates vicious topspin has turned average players into greats, and greats into legends. (Open, p.343)"